The MASDOC - CCA - OxPDE - MIGSAA student conference will take place at Warwick 1-5 April 2019. More information is available here. The MASDOC - CCA- OxPDE - MIGSAA student conference took place in Oxford 16-20 April 2018. The MASDOC - CCA- OxPDE - MIGSAA student conference took place at Heriot Watt 18 - 21 April 2017. 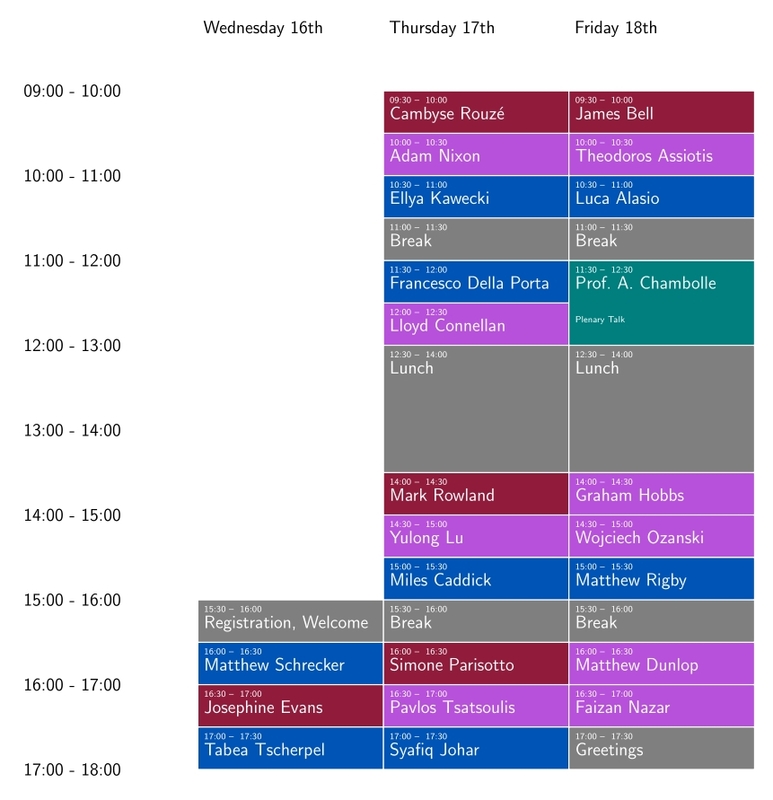 Timetable: A timetable of events and talks is available here. The 3rd MASDOC - CCA Joint Student conference took place in Cambridge on 17- 19 March 2014. Schedule for Monday 25th: Meet at Mathematics Institute in the Zeeman Building at approximately 12.00 noon where lunch is served. After dinner, which is served at 18:00, we will make our way to check into the accomodation. Poster: A conference poster is available here. Proceedings of the Conference: A document containing longer abstracts is available here. The 1st CCA - MASDOC Joint Student Conference took place in Cambridge in March 2012.